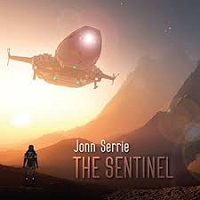 When I think of “space music” the first name that immediately comes to mind is Jonn Serrie. With an extensively impressive portfolio that includes award-winning film scores, projects for NASA and numerous concert performances at planetariums, Serrie’s pioneering brand of cosmic electronic music has spawned numerous protégés over the years and consistently remains the gold standard of its genre. Comprised of six compositions spanning just over an hour, The Sentinel is based on Stewart Cowley’s illustrated science fiction series of the late 1970’s that represents a virtual reality audio journey. On this intergalactic sojourn, the listener acts as the commander at the controls of a spaceship navigating the farthest reaches of the universe, guided along by state-of-the-art sound technology that feels incredibly life-like and three-dimensional. While Serrie’s extensive discography includes albums that range from world-flavored to spacy jazz, The Sentinel embodies the classic brand of electronic space music that he’s best known for and is styled in the mold of classics like And the Stars Go with You, The Stargazer’s Journey and Thousand Star. The opening title piece, “The Sentinel”, immediately embarks the listener on an interstellar journey that seemingly conveys images of a giant spaceship leaving earth and ascending through billowing clouds into space. Pristine synthesizers create undulating drones, celestial vocal washes and inexplicable effects of gravitational forces. Slipping into a bit of a darker mode towards the end, one gets the sense they’ve headed deep into space as the view of earth fades away out of sight. The stunningly beautiful “Centauri Arrival” ensues with unfolding layers of tenebrous chords and sparkling textures that paint a black canvas of shimmering stars. The title of this piece naturally implies one’s arrival at Alpha Centauri, the closest star system to our own solar system, of which many intriguing and ancient legends among various cultures abound. The eerily haunting “Ghost Ship” elicits images of the traveler’s spaceship having entered the atmosphere of an icy planet, as it descends through a fog of clouds to discover what lies below. Here, the music feels cautiously foreboding and exploratory, as supremely realistic sound effects evoke that of skimming upon the surface of a murky sea teaming with alien lifeforms. “Semblance on Laguna 7” seemingly ascends us back into the cosmic vastness where passing comets and distant galaxies soon come into view. An emerging light eventually unveils a glorious scene reminiscent of the many magnificent images captured by the Hubble Space Telescope such as the Eye of God and Pillars of Creation. Named for a star in the constellation of Pavo, “The Veils of Beta Pavonis” is a dreamily drifting piece that lightly carries the traveler upon a softly incandescent stream of stardust, as blanketing warm textures gently wash over one’s being while experiencing the freedom of weightlessness. Finally, “Starship Destiny Homeward” effectively recalls the undulating sound of an engine and controls of a cockpit with its many spine-tingling effects. Here, one seemingly enters through a wormhole where time itself dissolves, as pulsating waves form a rhythmic undercurrent that guides the traveler back home on a journey of many lightyears distance. Another masterpiece hailing from an artist whose remained among my favorites for many years, The Sentinel is easily one of this year’s best releases. Reaffirming my belief that music can serve as a channel, the experience of listening to this album feels like a portal opening to other dimensions and streams of consciousness, in which a celestial paradise always seems just out of reach. Unspeakably beautiful from beginning to end, this magnificent interstellar journey is not to be missed by astronomy buffs, cosmic dreamers, sci-fi and space music fans!